Popup Windows allow you to show a new window on top of your current window. The popup window can be useful to show multiple views at once, or you can use popup windows as a Face Plate. Click on the “…” button in the Target area to set the popup window. You will be presented with the Popup Window Settings dialog. Location sets the location on the screen where a new window will pop-up. All values are in pixels. Default: original size of the window. A window will be shown with the same resolution as is defined in the designer. 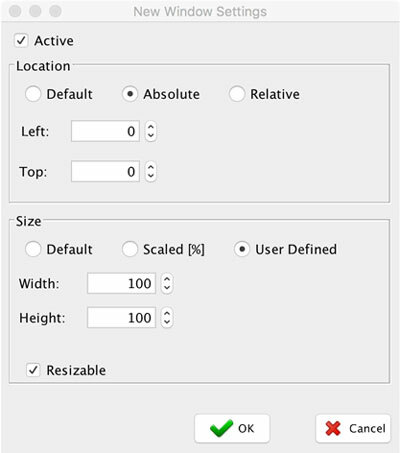 If resizable is selected, the user can resize the view. Otherwise, the size will be fixed.